I only read a couple pages before giving up and trying to sleep. I kept on waiting for the lights to go out, but it turns out they don’t turn off the light on the night train. I guess that’s to dissuade theft. The curtains for each berth is a shiny blue that hardly blocks the light from the aisle. You really need an eye cover for sleeping on trains, as well as earplugs. I did manage to sleep last night, though I kept on waking up and checking the time. Around 1:44 am, my phone rang, and it was an sms, saying I have special privileges in Ko Samui. I guess we were passing Surathani at that moment. The people on the train woke up as early as 6am. I tried my best to ignore them, but I had to go to the toilet, so I forced myself to get up. I was quite happy with the bed laid out, but since people in the upper bunk needed someplace to sit, I asked the attendant to fold away the bed. The took of the linens and sadly, the pillow too. We arrived in Hat Yai before 7am, and most of the Thais in the train got off at this junction. There was a lady who came on board selling fried chicken. It looked spicy, being reddish, so I only bought one and a small bag of sticky rice. This meal cost me 35 baht, the same price as the juice that the lady on the train offered yesterday afternoon. The chicken wasn’t spicy at all, and I kinda regretted getting only one. Still, it was enough to pacify my grumbling stomach. 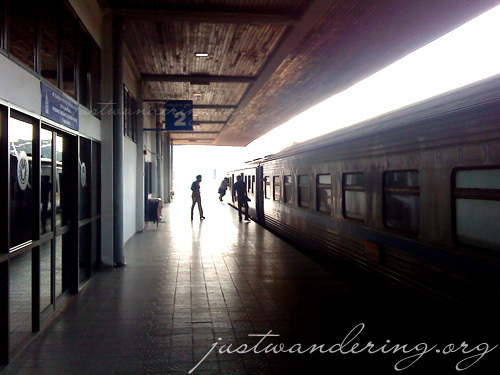 We took longer in Hat Yai than in other stations. I think they were removing some of the train cars. We left after about 40 minutes, and around 7:40am, we were at the border. We all got out of the train, and I was surprised to see that from 10 cars yesterday, we were down to just 3. Another engine came up and took away the third car, leaving us with only 2. There were only 2 immigration booths open in the Thailand side. The queue I was in was taking a long time, while the other booth seemed to be working on optimum efficiency. That is, until it came to this one gentleman that they’re having a hard time processing. In my own line, it was going smooth until they got to this one guy, and the immigration officer pointed him to go to the other booth. The guy after him was able to pass without problems, but when my turn came, the officer kept on scanning the pages, unable to find whatever it is he has to find to stamp me out of the country. He pointed me to go to the other booth as well. The gentleman who was having problems still wasn’t through. The three travelers who were behind him in line moved over to the booth where I was lined up earlier. A couple of minutes pass, and another immigration officer noticed me and the other guy waiting still waiting in line for this one booth, while the other booth was empty. He directed us to go back, but I told him we were told to go to this booth. He insisted and me and the other guy went. Oddly enough, this time, the immigration officer was able to find whatever it was he was looking for and stamped me out as quickly as the other travelers. What the hell. Going through Malaysian immigration was a breeze. There were nobody in queue, since most of them were already back in the train. We were asked to open up our bags for custom, but they hardly looked through my things. There was a health check though, and temperatures were taken from each passenger. Back in the train, there was another 30 minute wait as a new engine was attached to pull the cars. It was a KTM train now, with Malaysian crew and attendants (though the Thai crew were still onboard, but out of their uniforms). The train stopped at a couple of stations, taking in passengers along the way. A family boarded, and since there were many of them, they sat on different areas of the car. The mother sat across me. She started taking to me in Bahasa and I told her I can’t understand what she was saying. She asked me where I was from, and I said I’m from the Philippines. She said in broken English that she thought I was Malay. I love how I blend in in these parts. Save for my clothes and if I don’t speak, I pretty much look like a local. 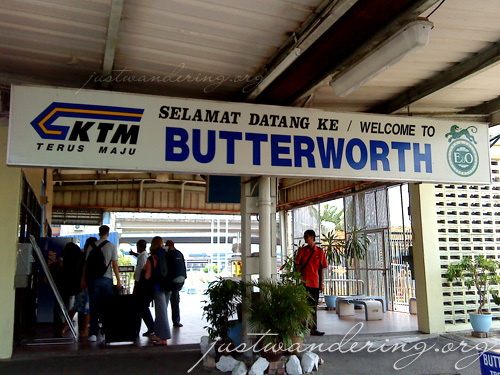 We finally pulled into Butterworth around 1:55pm in Malaysian time. I followed the other passengers out of the terminal, looking for a money changer and a way to get to Penang. The money changer was unfortunately closed for prayers, and wouldn’t open until 2:30pm. I get to talking to the elderly gentleman who sat across me in the train. He’s retired already, and is living in Thailand, since living in Europe is so much more expensive. He’s on a visa run, since he still hasn’t gotten his pension, and couldn’t get a longer visa in Thailand. This is his fourth time in Penang, so he already knows his way around town. He asked inside the train station for other money changers, because we need some ringgit to pay for the ferry that crosses to the island. He was told to go to the ferry, and they will change money there. Well, it’s not that they will change money there, but they will accept your money. They just wouldn’t give you change. The ferry costs RM1.20 per person, and this is already a return ticket. He gave them 50 baht, the smallest bill he has. Since he wasn’t getting any change for it, he decides to buy my ticket for me as well. I felt lucky, because aside from the free ferry ticket, the elderly gentleman is familiar with Georgetown. Since we both needed to change some money, we walked into town in search for the money changer. He shares how he loves Malaysia’s cultural diversity, and how friendly and hospitable people are. He talks more about his current life in Thailand, and how he wants to visit Luang Prabang and Angkor Wat while he’s in Southeast Asia. Soon we came upon a money changer, and we went our separate ways: him to his guesthouse, me to find a taxi to take me to the hotel. Here’s where I kick myself for making the most elementary mistake as a traveler: I realize I’ve forgotten to write down the address of the hotel. I printed my booking confirmation before I left Bangkok, and I assumed that the address of the hotel would be printed there. It wasn’t, so I tried my luck and hailed a taxi, hoping the driver knows where it is. The first cab I found haven’t even heard of the hotel. I got lucky with the second one, though he named his price right after telling me that he knows where it is. I was just too grateful to find someone who knows where the hotel is, so I agreed. He still turned on the meter, and when I got off outside Tune Hotel, it was just half of what I paid him. Pfft. Yup, you read that right, hotel. This is supposed to be a backpacking trip, I know. 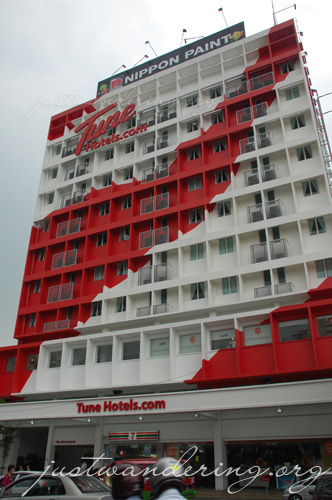 But the reviews I’ve seen online were all so discouraging, that I just gave up and booked with Tunehotels.com. Of course, it was only after I checked in that I remembered Ajay recommending a couple of Penang guesthouses from her recent trip. Oh well. Besides, I’ve been wanting to try it out since I first found out about thisno-frills hotel. There was a bit of a wait during check in, but other than that, it went without any problems. My room is on the fifth floor, and I dutifully followed the signs to my room. It turns out my room was closer to the lift if I went the other way than directed in the sign. The room was pretty nice, with the bed dominating the room. I haven’t laid on the bed yet, but sitting on it has been very comfortable. I love the pillows too. 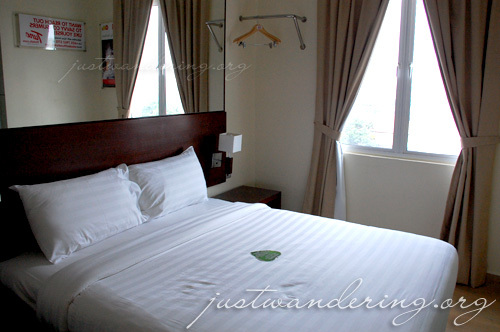 The room is pretty small; it’s just as big as my room in HI Sukhumvit, except this room has its own toilet and bath. It does have two side tables though, a personal safe, a pull out desk and two huge mirrors. It also have a window that looks out into the neighborhood and a ceiling fan. Use of the aircon entails an additional fee, and it comes on 12-hours or 24-hours block. The toilet was expectedly small. The shower area, though small is not cramped, so is the sink (specially with the door open). But the area where the toilet was… too small. When I sit on the toilet, the wall is less then an inch from my knee. But it’s clean and the shower is really really nice so I’m happy. After a quick shower, I took a walk down the street to look for a place to have a very late lunch. The first thing I saw though, was a very commercial area with a Starbucks dominating the front. I walk past it, and came upon a food hall in the other corner. It had a sign that says Hokkien Mee, so I eagerly crossed the road. Turns out the Hokkien Mee stall was closed, so I ended up just getting rice and a variety of fried meat. I was kinda hoping for at least a roti or char kway teow, but eh. It’d do. I walked back down Jalan Burma towards Jalan Penang. I wanted to try to find the bus station to book tickets for my bus going to the east coast, but there weren’t any taxis. I got so used to seeing so many taxis in Bangkok, that it seemed as if there’s hardly any in Penang. I walked and walked, and came upon the pedestrian cross walk. Instead of crossing over to Jalan Penang, I ended up going to Komtar. In the maps inside the brochures for Penang, there’s a big red dot and a text that says KOMTAR. I wondered what Komtar was, and apparently, it was a shopping center. 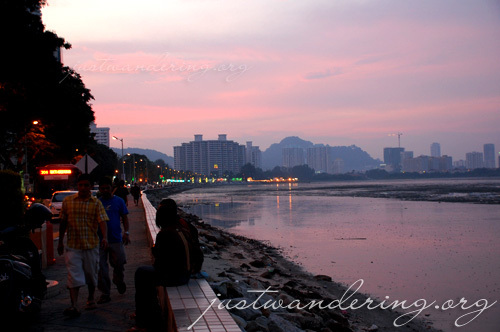 I later found out that Komtar is the tallest building in Penang, and the fourth tallest in Malaysia. I decided to just walk back to my hotel, and research about the buses crossing over to the eastern side of Malaysia. It has started drizzling when I got out of Komtar, and the rains became heavier as I walk. I eventually had to take shelter in one of the closed buildings to wait until the rain stop. When I got back, I just had time to go online in the lobby, process some photos and start writing this entry before going down to the lobby to wait for Wei. Wei is one of the friends I’ve met online. We met through hey.nu, my old web host, back in 2002, I think. He’s from Johor, but he’s here in Penang for work. From the lobby, we went down to the street level and to my surprise, he took me to New World Park, that commercial place with the Starbucks. I was surprised because behind the stores up front is a food court. And they have Hokkien Mee! Turns out he was just parked there. We drove to Gourney drive, that overlooks the water and Butterworth. It was a street lined with hotels, a mall and restaurants and since it was Friday night, there were plenty of people. There was a hawker market, and after looking through the selections, I settled on having char kwey teow, a noodle dish that became an instant favorite since I first tried it in Singapore last time. I ordered for a small plate, and the stall keeper was surprised when I handed him the money. 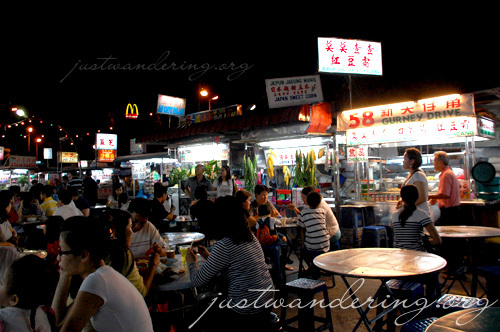 It turns out that in these hawker places, you order the food, they deliver it to your table, and you pay them once you get your food. As for the drinks, there’s no need to stand up, as the stall in charge for the drinks in a particular area will go to your table to take your order. As I was digging into my plate of noodles, I commented that char kwey teow is a lot like pad thai. To my horror, Wei confirms this. Nothing against pad thai, but I’m already pad thai-ed out, to borrow Mikoy’s term. I’ve avoided ordering the noodles during my last days in Bangkok, and it’s ironic that one of the first things I have here is basically the Malaysian equivalent. Still, there were other things to try. Wei bought some rojak, which is a is a mix of anything and everything. It as fruits, vegetable, and even seafood, and they’re all slathered with a special sauce. I’m not quite sure how to describe how it tasted like (most of the time, I’ve no idea what I was biting into since everything was slathered in a dark brown sauce), but it was actually pretty good. I was also introduced to chendol. While walking from the jetty port, we passed by this stall that sells chendol. Right next to the sign that says “best chendol in Malaysia” is a huge container of what looks like green slimy things. It doesn’t look appetizing, especially if you have an active imagination. When I asked Wei about it, he just said I had to try it. So I did, and I liked it. The green things are like gelatinous things made with flour. It’s mixed with some beans and syrup, then topped with ice and coconut milk. It’s a great refreshing dessert, and it’s not overly sweet nor rich. After dessert, I went to have some more meat. 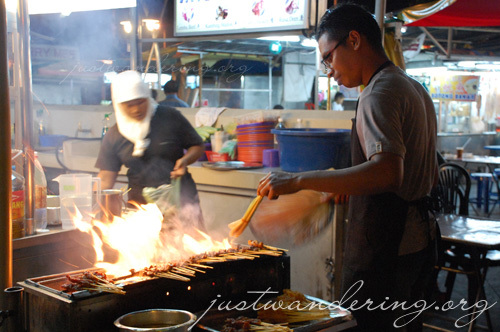 We went to the satay stall, and I had one of each: beef, mutton and chicken. They were all marinated in the same peanut sauce, but it’s the beef that really absorbs the flavor. And that sauce was amazing. After dinner, we walked inside the mall for some air conditioned comfort, then drove around Georgetown. There are so many beautiful colonial buildings around Georgetown, that you can just walk in any street and there would be something that would catch your attention. Definitely looking forward to exploring more tomorrow! Food sounds yummy. I want to try chendol. It sounds like halo-halo.